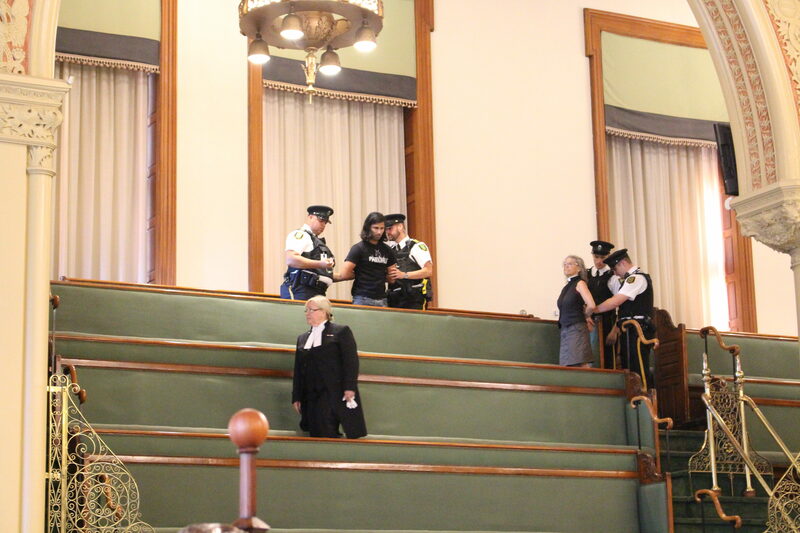 Two members of the public were charged with trespassing when they refused to leave the Queen’s Park public gallery after a rare — and controversial — Saturday session of the legislature. They were among several people who were in the gallery to protest during the planned debate over Bill 31, the second attempt by the government of Premier Doug Ford to cut the number of Toronto city councillors, from 47 to 25. One of the two people arrested was Maggie Helwig, 56, an Anglican priest at the Church of Saint Stephen-in-the-Fields. Helwig was among other members of the public yelling, “Shame!” when the meeting was cut short by government house leader Todd Smith’s motion to adjourn. Helwig immediately shouted her disapproval and refused to leave the public gallery when the meeting adjourned after just 45 minutes. “It was just another example of [Ford] overriding the normal procedures of our political system… I was asked by Queen’s Park security to leave and declined to do so,” Helwig said. Helwig says that after she refused to leave, police were called in to issue the charge for trespassing. She was issued a $65 trespassing ticket and then escorted off the property. She says she has not decided whether to dispute the ticket or pay the fine. The other person arrested was given the same charge and released with Helwig. Security had also escorted one woman from the gallery during the meeting, after she yelled, “Pay attention,” to Ford during the period when members presented petitions from their constituents. Ford periodically had his back turned to the opposition during their speeches. The rare weekend meeting began with a press conference in which Smith asked the opposition for unanimous consent for Bill 31, the Efficient Local Government Act. When Smith presented his request, however, he was drowned out by opposition MPPs. Saturday was the second day of the NDP’s proposed amendment to delay the passage of Bill 31. During the debate, the official opposition asked the Speaker to rule on whether the bill was out of order. NDP MPP Gilles Bisson said the legislature cannot debate a bill that has already been debated. “Is Bill 31 different enough from Bill 5 to be considered? Our answer is no,” Bisson said. Bill 5 was ruled unconstitutional by an Ontario Superior Court judge last Monday. If the speaker ruled that the two bills are too similar, then Bill 31 would be considered out of order. However, Smith moved to adjourn the meeting before the Speaker made the ruling. Cutting off this debate hit a nerve for Helwig. She insists that she does not have anything against Ford trying to reduce the size of city council, but said his overriding of the court decision by invoking the Constitution’s notwithstanding clause was unacceptable. “He’s overriding the democratic process and setting a precedent, which would enable him to do so for whatever he likes in the future and other future politicians to do so,” Helwig says. Helwig is a long-time activist. She told the Ryersonian that the last time she was arrested in Toronto was for being a part of an Occupy Toronto demonstration in 2011. “That was somewhat more complicated business, which essentially meant putting up a mosquito net in the park,” Helwig said. The second reading of the bill will take place throughout the early morning hours on Monday. The all-nighter plans came after the lieutenant-governor was asked to reconvene the House at 12:01 a.m. to expedite the passage of Bill 31. The government and opposition will have up to six and a half hours to debate the bill. The province wants the bill passed by the end of the week. The earliest it could happen is Wednesday or Thursday.